Turtlenecks are back! Today I bring to your attention magnificent collection of women's high-neck tops and sweaters ideal for windy and chilly days and evenings wear. I start to notice many girls and ladies wearing this perfect garment in the streets layered by coats or jackets. 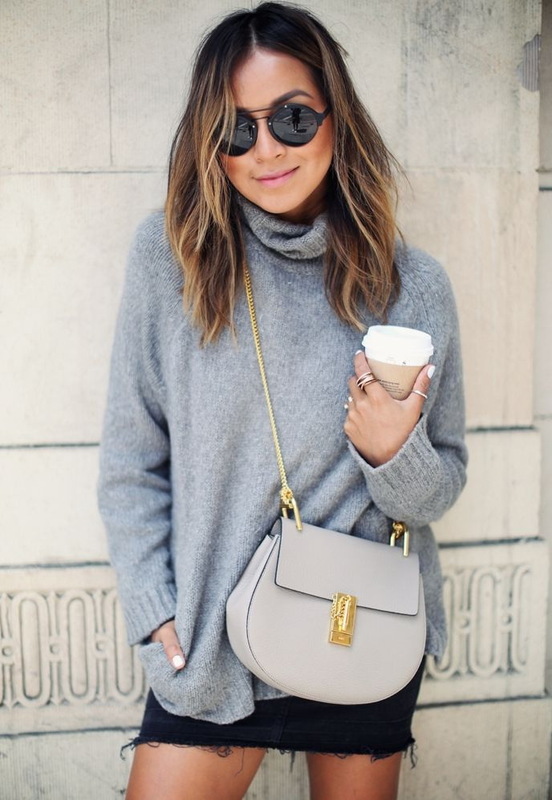 The turtleneck can be used for layering purposes or styled on its own. The ideal style is the one that is not only breathable, but also warm and versatile. I decided to choose less or more classic color versions, including cream-beige, black, grey, crispy white, burgundy, etc. It's no deny, this top deserves a spot in your wardrobe. This one is my favorite. We see a pale green knitted cropped turtleneck with long-sleeves styled with asymmetric cut abstract mirrored high-waisted pencil skirt. Of course you can pair it with a maxi skirt, just use your imagination as you wish! Whether you are familiar to turtleneck or you just thinking of buying one for yourself, I want to show you some tips and ideas on how to make this garment look chic and unique. This style is versatile enough to be worn on its own or under anything, starting from draped coats to blazers. Yes, you can wear them up or down. Personally, I like to underline my uniqueness by embellishing my high-necks with statement jewelry. Speaking of bottoms, then everything depends on your creativity and turtleneck's length. Wear it with jeans, skirts, leggings, etc. I think from now on it will quite easy for you to stay warm and look chic, by wearing one of the coziest trends of this year: turtleneck. If you still looking for fresh ways to work a turtleneck, then I've got 12 amazing outfits that scream Oh so Chic!